"The Jolson Story" was highly successful and did much to revive Jolson's career which had been sagging during the years previous to the film's release. The film won numerous Academy Awards, i.e. for Best Music, Scoring of a Musical Picture, and Best Sound Recording. 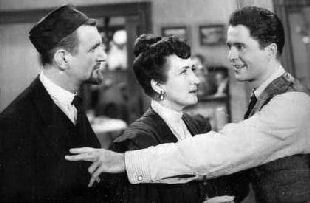 Larry Parks was nominated for Best Actor in a Leading Role, and William Demarest was nominated for Best Actor in a Supporting Role. The film was also nominated for Best Cinematography, Color and Film Editing. The great success of "The Jolson Story" spawned a sequel "Jolson Sings Again" just three years later--also successful, but not as much as the first film. 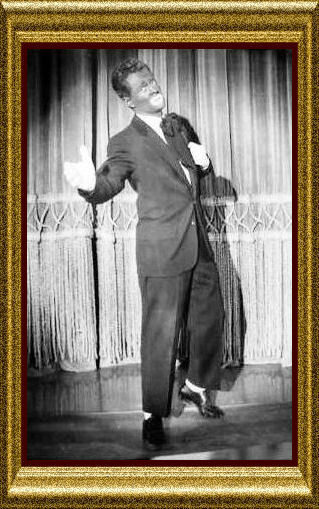 "The Jolson Story" introduced the talents of Al Jolson to a new generation. 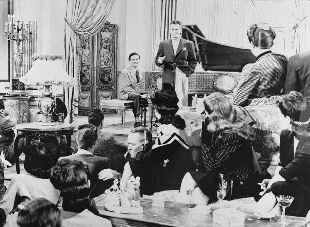 This lead to many guest appearances on the radio, as well as a starring role on a NBC radio program called "The Kraft Music Hall," which ran from October 1947 to May 1949. The screenplay for this film was mostly fictional, though it did contain certain elements of truth. He first started in show business by singing from the balcony. His name was really Asa Yoelson. Some characters, however, were created from a composite of characters from Jolson's real life, e.g. his manager. In the film he has parents he refers to as "Papa" and "Mamma" Yoelson. In the film, however, his mother lives a long life; in reality, Al's mother died when he was only eight years old. A sequel to "The Jolson Story" was produced in 1949 (named "Jolson Sings Again! 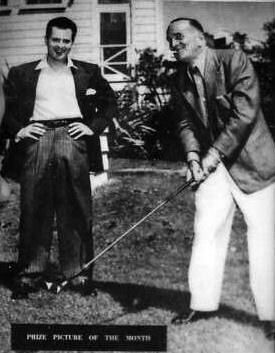 "), also starring Larry Parks, that covered the period of Jolson's life between 1939 and 1948. The films imply that Jolson had only two wives although he actually had four. His last two wives were Ruby Keeler and Erle Galbraith, though their real names weren't used in the film. Keeler, having been divorced from Jolson for more than six years, did not even want her name associated with the picture. At the time "The Jolson Story" was released, Jolson was happily married to his fourth wife, Erle, since March 1945. 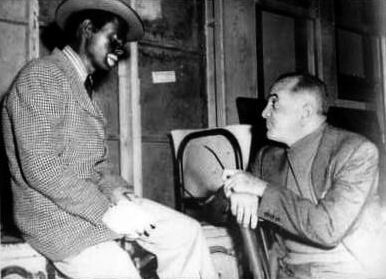 With performer Tom Baron soused and blacked out in his dressing room, young Jolson decides to take his place, for the first time singing in blackface. 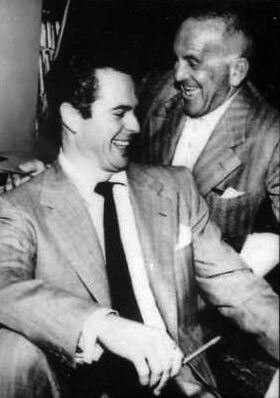 Hammerstein and Docksteder are seated nearby. Jolson sings out: "Rosie, you are my posie...you are my heart's bouquet....Come out...here in the moonlight....there's something, sweet love, I want to say....,Your honey boy am waiting...those ruby lips to greet....don't be so aggravating....my blushing Rosie, my posie sweet...."
From this impressive performance, Jolson is offered work with Docksteder's Minstrel. Hammerstein thinks this is Baron and signs Baron up for his own show. Jolson returns home to his parents' home after having left the Docksteder's Minstrels. 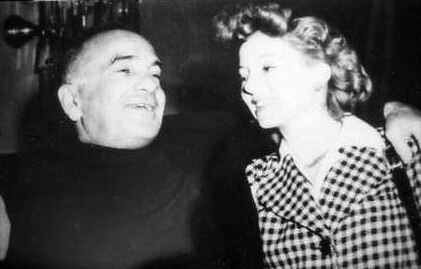 He receives a telephone call from Tom Baron who, having performed quite unimpressively for Hammerstein, was put in charge of the new Winter Garden Theatre in New York City. "Show's running too long. It's almost eleven now. Who's on next?" asks the stage manager. "Jolson." "We'll cut Jolson out and jump to the finish." 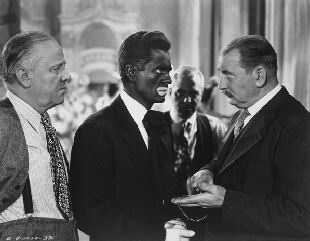 Jolson says, "Hey, wait a minute!" The stage manager says "Call the orchestra leader. Tell him we're cutting out the Jolson number." Jolson is adamant. "Look, I want to go on...Where's Baron? Ask Tom Baron?" The manager says, "Baron isn't running this end of it, I am. 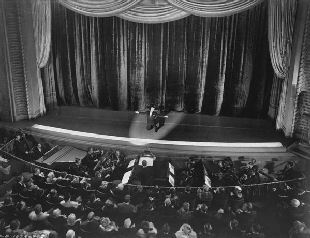 "Jolson nevertheless runs onto the stage. The stage manager yells out to him, "Hold it! You're not on!" Jolson says, "That's what you think!" "Well, I see a rival producer sitting out front. Ziggy, will you stand up and take a bow? Try and stop him! Folks, not to much...Say Ziggy, who's that pretty gal with you?" Ziegfield announces, "This is Julie Benson, the star of my next production, 'Showgirl. '"(applause)" Mr. Ziegfield, you will please not advertise on my time." 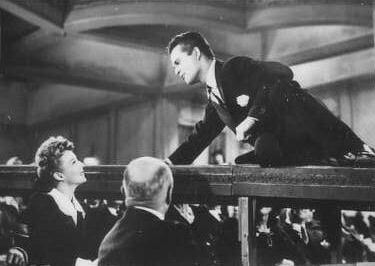 (laughs) Jolson: "Glad to know you, Miss Benson..."
"Though April Showers may come your way..." Jolson to Julie, smiling, "Just for you....just for you..."
Jolson, on one knee, sings to an adoring crowd. Jolson and wife Ruby Keeler performed together in only one production--the 1935 film "Go Into Your Dance." Here is the Larry Parks-Evelyn Keyes version. Often after his performances, Jolson would have friends come up to his apartment until the wee hours. While there, he would often perform for them. During one of these post-performance parties he sings "Cantor on the Sabbath" (in Yiddish.) This scene was cut out of the final version of the film, as it was considered to be "too ethnic." 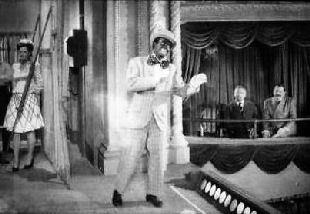 Jolson's song "Sonny Boy" was originally supposed to be included in "The Jolson Story," but this too was also excluded in the version released to the public. 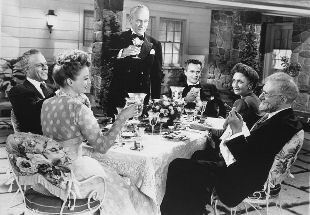 Here Jolson's parents visit the house of Al and wife and are dining out on the patio. The group toasts his parents , as this is their wedding anniversary. They ask Al to sing a song, but he needs convincing. The sense is that, though he states that he is now retired from show business, he still misses performing before a live audience. He wants them to know that he doesn't miss it and plans to stay retired. He finally consents to serenade his parents and sings the "The Anniversary Song."